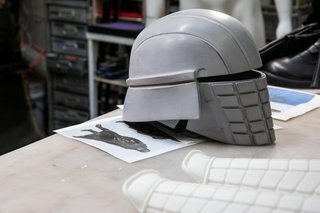 For Silicon Valley Comic Con, I went a Knight of Ren from Star Wars. The costume was a collaboration with Darrell Maloney (aka "The Broken Nerd" on YouTube), who came to my shop a few days before the con to build with me. Here's one of the 3D printed helmets he brought. Darrell is an incredibly talented prop maker, and if you haven't checked out his work, you should.